Last time, we met an energetic and a passionate professional from Bangalore, India : Mr. Debasis Das who is already on his journey towards financial freedom. You may read more about his journey and experience till now by clicking here. The response to such posts has been overwhelming. In continuation with our effort to interlock you with some common men and women who have been seeking financial freedom, today, it is a chance to meet another young and dynamic Strategy Consultant from Capgemini Bangalore - Mr. Rajesh Subramanya. We are currently mentoring Mr. Rajesh and have helped him to build a financial freedom plan of his life. This monthly track-able plan, once executed, has the potential to bring him and his family out of the rat race and allow him to chase the true dreams of his life. This plan can make him experience "true freedom" in life. And as we all know "Freedom can buy you what money cannot !!" So, let's meet Mr. Rajesh Subramanya to know who he is, what his dreams and goals are, why is he chasing financial freedom, and how has been his experience since he has set himself on this journey towards financial freedom. So, here we go, lets meet with our next freedom seeker : Mr. Rajesh Subramanya. 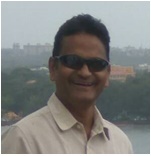 Mr Subramanya is passionate about helping our generation imbibe the concept of financial freedom. He is also very committed to educating poor children and elevate the world around him. Like us, Rajesh also happens to have a soft corner for our environment and wishes to create a new greener India. Today, Rajesh faces stress and anxiety. He wants to overcome that. He wants to lead a fearless life, and why not? Each one of us deserves to enjoy our life - doing what we love doing, rather than just moving with the grind. Life need not be an either-or. Rajesh has started this journey while being in a corporate job. He has kick started his journey towards financial freedom to be free from rat race and start living the life of his dreams. We will be together monitoring his journey, and even beyond. We will also tune his portfolio during the course of this journey, so that his journey stays on track. Our regular mentoring with Rajesh would include maximizing returns from his existing investments, tuning the portfolio, and fine tuning the plan depending on how life shapes up for him and his family. We wish Mr Subramanya all the best for his life and wish that he can go on to chase his true dreams and calling in life. Mr Subramanya is just one among you. He is no different, except the fact that he took a step to connect with us, was open to accept our advice, and then worked on that advice. He took the first step. He came out of his comfort zone and will surely be rewarded for the same, in times to come. Do you think it is wise to have a financial plan in place for your life, instead of randomly doing investments with no target in mind? Do you think life should be much more than just earning money? Do you exactly know how much money you need to get financially free? Do you exactly know how much time you need to accumulate that kind of corpus which can fund your and your family's expenses for the rest of your life? Do you know how can you maximise your returns on your net worth? Do you know that massive wealth without the required liquidity in your portfolio can lead to a situation where your money is locked and you cannot fund your goals. If you have any of the above questions pondering in your mind, or you have any genuine financial query, or you have strong dreams on which you are yet to start working, do write to us at help@manoj-arora.com and we will be happy to share our experiences with you, so that we can work together and plan a better future for you. There are no charges, no constraints ... only freedom !! If you fail to plan, you are planning for failure !! Mr. Stock decides to start a STOCK DICTIONARY ! Kalpavriksha springs up in Mumbai !